In November 2017, the government announced that they will publish a green paper on care and support for older people by summer 2018. Commentary on what this green paper should look like have all shared similar themes - themes which are neatly outlined in the Guardian article by Vic Rayner, Executive Director of the National Care Forum. Here, she details the need to acknowledge people, the complexity and individuality of their changing needs and their desire to be engaged and involved in their own care. Innovation is crucial, with Rayner focusing on innovative housing and community models and integration between health and social care. Finally, technology is essential. We must wholeheartedly embrace digital technology, especially the replacement of pen-and-paper systems, and utilise the data held in these to the advantage of those receiving care. When technology can help deliver more effective care, we should not shy away from it. At Konnektis, we embrace these messages and want to help shape the future of care. We see ourselves as at the forefront of the technological revolution that is badly needed in care. By replacing pen-and-paper records we enable crucial data that is locked in these systems to be accessed by all in the support network in such a way that enables better decision making, more informed care, and greater involvement from the individual and their family members. The carer workforce is incredibly important to Konnektis. Understanding the remarkable work they do has allowed us to create a system that works for them. The Konnektis platform was co-designed with carers to create a usable, effective system. They now feel more able to do their job and spend more time caring and less time searching through paperwork. We keep people at the centre of what we do. Konnektis was built on family experiences and the recognition that individual care needs change quickly and paper systems cannot keep up with this. It starts with small changes: people get prescribed new medications or their dietary needs change. However, if there is miscommunication about these simple things, they can escalate into crisis and hospitalisation. Real-time communication and the connection of ALL parties involved in someone’s care sidesteps this problem, because everyone is appropriately informed. Care should be tailored towards the individual and their individuality should be embraced. Our age-friendly home screen is personalisable, with buttons to connect to apps relevant to that individual. The live care diary also keeps the person in the loop about their own care as they know who is coming next and when. Links to information about services available to them allows people to be more informed and have greater choice when it comes to their care pathway. 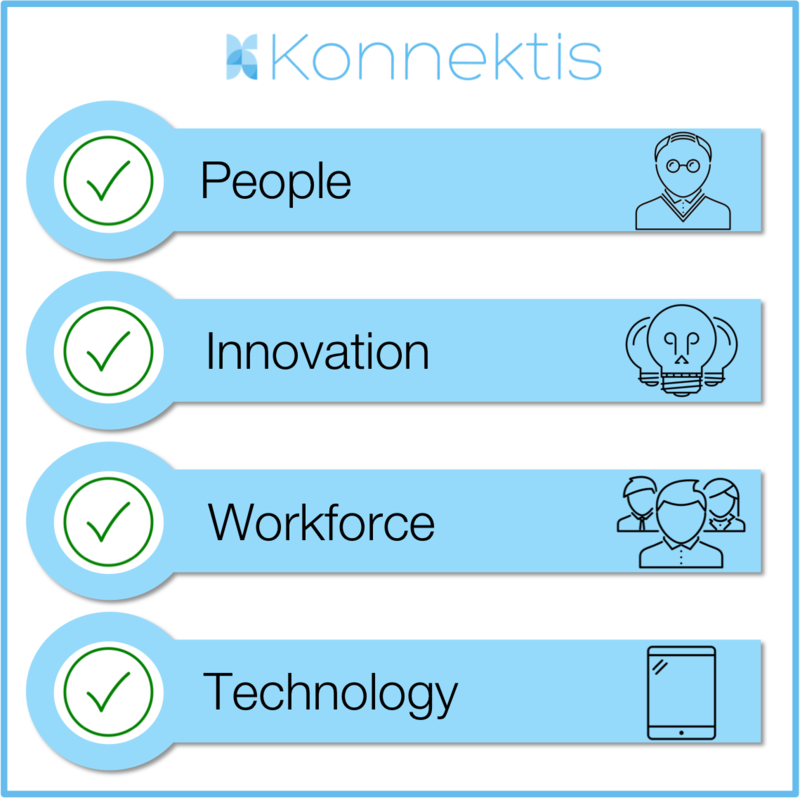 We are currently developing even more ways to make care more personalised through the Konnektis platform. Do you have ideas? Please don’t hesitate to get in touch, and help us to deliver the future of care.